Miso Crafty Knits: Pumpkin #4...It's a Thriller! Here it is, Brett's 4th pumpkin of the year. In case you can't tell (even with the title of this post) it's the King of Pop, Michael Jackson! Now some of you are probably wondering what's so evil about MJ? Well, have you not seen his video for Thriller?? I don't know about you, but for me, whenever I hear the song or see the video, I immediately think of Halloween. 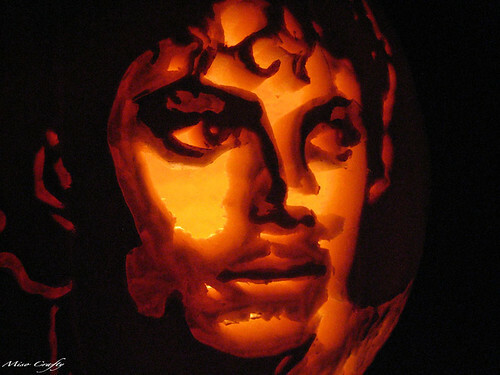 Michael Jackson, Thriller, and Halloween just seem to go hand-in-hand. Don't you think? I have a friend, Amanda, who to this day cannot handle anything to do with Thriller. Why? She was completely traumatized as a child and was scared out of her wits when she saw the video. One time, back in high school, we were shopping when the song came on. I actually hadn't heard it come on, as it was only a few bars into the song, but Amanda had heard enough that the hairs on the back of her neck were standing up. She had grabbed me and ran out of the store. I thought she was hearing things, but sure enough, the song was playing and she had quite the spooked look on her face. Yeah...all because of MJ. May he finally rest in peace. 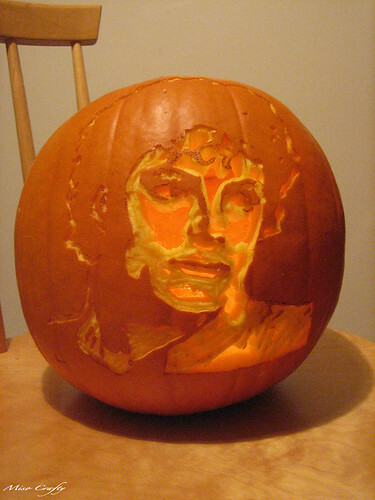 Brett decided to do Michael for several reasons...as a tribute ("it's topical" claims Brett), because of the aforementioned Thriller = Halloween issue, and because it looked like it would be a hard design to do. We have one pumpkin left...that is, if Brett doesn't come home from work tonight with more. Tonight he'll be working on the hardest design he has ever done. He had shown me a photo of what the design was, but I can't remember. What I do remember though, was that it was definitely spooky and very evil looking. So stay tuned! 1... your husband is amazing. and 2.. your husband is amazing! (I too am forever traumatized by thriller. We had the record when I was a little girl and when it came on, I would hide under my bed) I really enjoyed seeing the fabulous pumpkins! I think my love of horror films is what prevented me from being traumatized by Thriller! 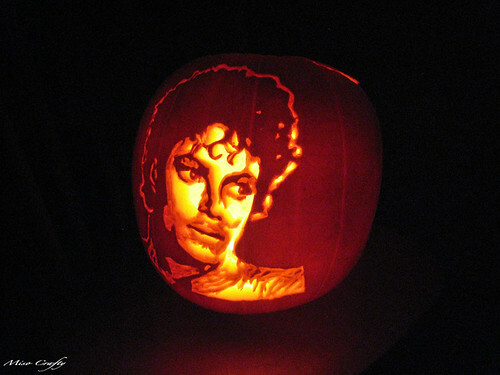 i dont do halloween, but every yr i HAVE to hear thriller on the radio. wow!!!! 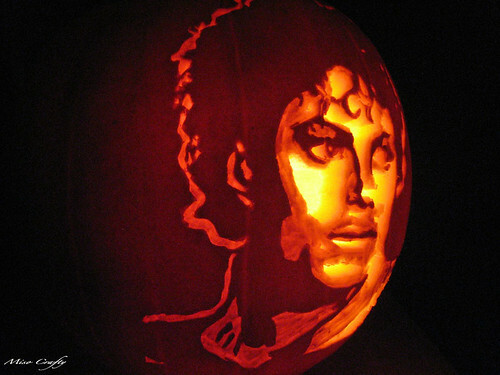 he is phenomenal at carving pumpkins! Thank you so much! 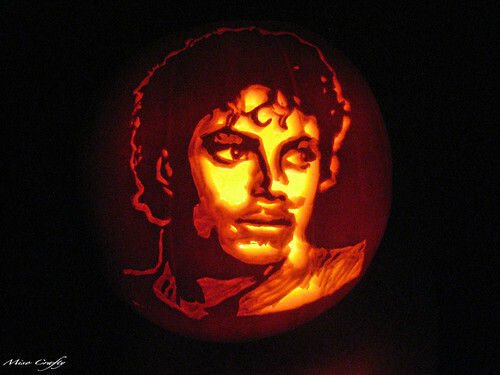 I have to say, it isn't Halloween until I hear Thriller! Actually, it doesn't feel like October to me until I hear that song!